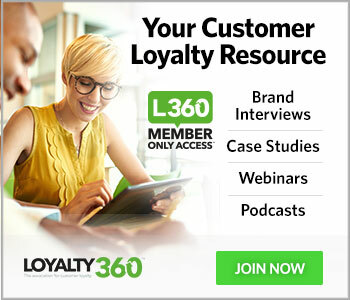 Applicant agrees to become a member of Loyalty360, The Association for Customer Loyalty. No Member Agreement is binding on Loyalty360 until the Association receives the applicable annual membership fee based on the level of sponsorship. Applicant agrees that once paid, all membership fees are nonrefundable for any reason, including termination of membership. This Agreement is entered into for the benefit of Applicant and the Association and not for the benefit of any third party. Similarly, Applicant agrees that it will not assert rights under any agreement between the Association and any other Member unless such agreement provides by its express terms that Applicant is an intended beneficiary of that agreement. THE INFORMATION FROM OR THROUGH THE SITE IS PROVIDED "AS-IS," "AS AVAILABLE," AND ALL WARRANTIES, EXPRESS OR IMPLIED, (INCLUDING BUT NOT LIMITED TO IMPLIED WARRANTIES OF MERCHANTABILITY AND FITNESS FOR A PARTICULAR PURPOSE) ARE DISCLAIMED TO THE FULLEST EXTENT PROVIDED BY APPLICABLE LAW. THE INFORMATION AND SERVICES MAY CONTAIN BUGS, ERRORS, PROBLEMS OR OTHER LIMITATIONS. WE AND OUR AFFILIATED PARTIES HAVE NO LIABILITY WHATSOEVER FOR YOUR USE OF ANY INFORMATION OR SERVICE. IN PARTICULAR, BUT NOT AS A LIMITATION THEREOF, WE AND OUR AFFILIATED PARTIES ARE NOT LIABLE FOR ANY INDIRECT, SPECIAL, INCIDENTAL OR CONSEQUENTIAL DAMAGES (INCLUDING DAMAGES FOR LOSS OF BUSINESS, LOSS OF PROFITS, LITIGATION, OR THE LIKE), WHETHER BASED ON BREACH OF CONTRACT, BREACH OF WARRANTY, TORT (INCLUDING NEGLIGENCE), PRODUCT LIABILITY OR OTHERWISE, EVEN IF ADVISED OF THE POSSIBILITY OF SUCH DAMAGES EXCEPT AS OTHERWISE REQUIRED BY LAW. THE NEGATION OF DAMAGES SET FORTH ABOVE ARE FUNDAMENTAL ELEMENTS OF THE BASIS OF THE BARGAIN BETWEEN US AND YOU. THIS SITE AND THE PRODUCTS, SERVICES, AND INFORMATION PRESENTED WOULD NOT BE PROVIDED WITHOUT SUCH LIMITATIONS. NO ADVICE OR INFORMATION, WHETHER ORAL OR WRITTEN, OBTAINED BY YOU FROM US THROUGH THE SITE SHALL CREATE ANY WARRANTY, REPRESENTATION OR GUARANTEE NOT EXPRESSLY STATED IN THIS AGREEMENT. WE DO NOT PROVIDE LEGAL ADVICE NOR DO WE ENTER INTO ANY ATTORNEY-CLIENT RELATIONSHIP. ALL RESPONSIBILITY OR LIABILITY FOR ANY DAMAGES CAUSED BY VIRUSES CONTAINED WITHIN AN ELECTRONIC FILE CONTAINING THE FORM OR DOCUMENT IS DISCLAIMED. WE WILL NOT BE LIABLE TO YOU FOR ANY INCIDENTAL, SPECIAL OR CONSEQUENTIAL DAMAGES OF ANY KIND THAT MAY RESULT FROM USE OF OR INABILITY TO USE OUR SITE. OUR MAXIMUM LIABILITY TO YOU UNDER ALL CIRCUMSTANCES WILL BE EQUAL TO THE PURCHASE PRICE YOU PAY FOR ANY GOODS, You represent and warrant that if you are purchasing something from us or from Merchants on third party sites that (i) any credit information you supply is true and complete, (ii) charges incurred by you will be honored by your credit card company, and (iii) you will pay the charges incurred by you at the posted prices, including any applicable taxes. We may allow access to or advertise third-party product or service providers ("Merchants") from which you may contract to purchase certain goods, services or consulting. You understand that we do not operate or control the products or services offered by Merchants. Merchants are responsible for all aspects of consulting, order processing, fulfillment, billing and customer service. We are not a party to the transactions entered into between you and Merchants. You agree that use of such Merchants is AT YOUR SOLE RISK AND IS WITHOUT WARRANTIES OF ANY KIND BY US, EXPRESSED, IMPLIED OR OTHERWISE INCLUDING WARRANTIES OF TITLE, FITNESS FOR PURPOSE, MERCHANTABILITY OR NONINFRINGEMENT. UNDER NO CIRCUMSTANCES ARE WE LIABLE FOR ANY DAMAGES ARISING FROM THE TRANSACTIONS BETWEEN YOU AND MERCHANTS OR FOR ANY INFORMATION, SERVICE OR PRODUCT APPEARING ON MERCHANT SITES OR ANY OTHER SITE LINKED TO OUR SITE. 18. Proposed Product and Service Offerings. All descriptions of proposed products and services are based on assumptions subject to change and you should not rely on the availability or functionality of products or services until they are actually offered on the Site. We reserve the right in our sole discretion to determine how any products and services will be offered and awarded. This determination includes, without limitation, the scope, nature and timing of all such offers and awards. All products and services agreed upon for paid memberships must be used during the membership period. Any unused products and services will expire at the time of the membership expiration. Should any part of this Agreement be held invalid or unenforceable, that portion shall be construed consistent with applicable law and the remaining portions shall remain in full force and effect. To the extent that anything in or associated with the Site is in conflict or inconsistent with this Agreement, this Agreement shall take precedence. Our failure to enforce any provision of this Agreement shall not be deemed a waiver of such provision nor of the right to enforce such provision. This Agreement is the complete agreement and supersedes all prior or contemporaneous understandings, negotiations and communication, whether oral or written, with respect to the subject matter hereof. Only LOYALTY360 may modify this Agreement, and it may make modifications at any time. Modifications will be in effect upon posting to the Site.